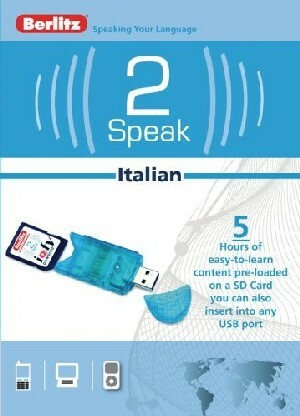 Now it s even easier and more convenient than ever to learn Italian whenever and wherever you like. Just plug this portable divide into the USB port on your computer or PDA (Sheryl please note that the SD card does not fit into newer devices. What generation devices can support the SD card? Let me know and I ll include that in the copy) for effective, flexible language learning at home or on the go. Five hours of audio instruction narrated by native speakers include 31 short narrated lessons featuring many everyday situations such as introductions, dining, shopping and making small talk.